You Don't Need To Take Your Stress Out On Your Teeth! ...But many of us, when stressed or anxious clench our jaws together and grind our teeth. This condition is called “bruxism”. Though hardly a conscious act, it can nevertheless be one with serious consequences. In severe cases, the act of grinding your teeth can cause tooth fractures, loosening of your teeth, receding gums, or other damage. Most teeth grinding occurs during sleep and those that do it aren’t usually aware that they grind their teeth. Many times it is their sleeping partner or family member who first notices the sleeping disorder. However, if you wake up with a headache or a sore jaw, chances are you spent most of the night gnashing your teeth. 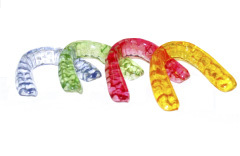 To help you prevent pain and tooth damage, we can provide you with a custom mouth guard. If you are not sure if you grind your teeth during sleep, we can evaluate your mouth for signs of tooth damage due to bruxism and help get you the relief you seek. A nighttime dental guard can provide a cushion of space between your teeth that will protect them from the destructive forces generated by overactive chewing muscles. This aggressive muscle activity, called teeth grinding and clenching can cause excessive tooth wear, chipping, fractures, loosening of the teeth or even TMJ disorder. Spacing your teeth apart also decompresses the jaw joints (TMJ). This decompression is an unloading of the joints, much like crutches allow you to take the weight off an injured knee or hip. The night guard is designed to re-establish your "natural" freeway space, which will protect your teeth from clenching and grinding day or night. We have many patients, even some of our staff members, who have stopped this neuromuscular disorder while wearing a nighttime dental guard. Call us today, if you feel you may be suffering from any of these symptoms, to learn how a nighttime dental guard can help. Sometimes, even if we give great care and attention to dental hygiene, our teeth just aren’t as white as we would like. While regular dental check ups and brushing can minimize discoloration, certain layers of our teeth naturally become yellow over time. But most of us feel our most comfortable with a whiter smile. To help in accomplishing the brighter smile, The Opalescence GO 10 Day trays. It really is as simple as wearing a small transparent tray for 30-60 minutes a day for 5 days. But the gel on the inside of the tray can make your mouth a whiter place. As with all dental procedures, you should consult your dentist before using this product. It should not be used if you are wearing braces and cannot take the place of good old fashioned dental hygiene. But if the look of a whiter smile is what you want, Opalescence Go! The 10 day trays in a 15% hydrogen peroxide solution strength is available in our office to take home today for $60.00. HSA Cards can be used for whitening products! Have you used the 10 day trays? Tell us about your experience here! We want your feedback!